Citrus is a staple in the Sunday Suppers kitchen, particularly at this time of year when the market is overflowing with variety. 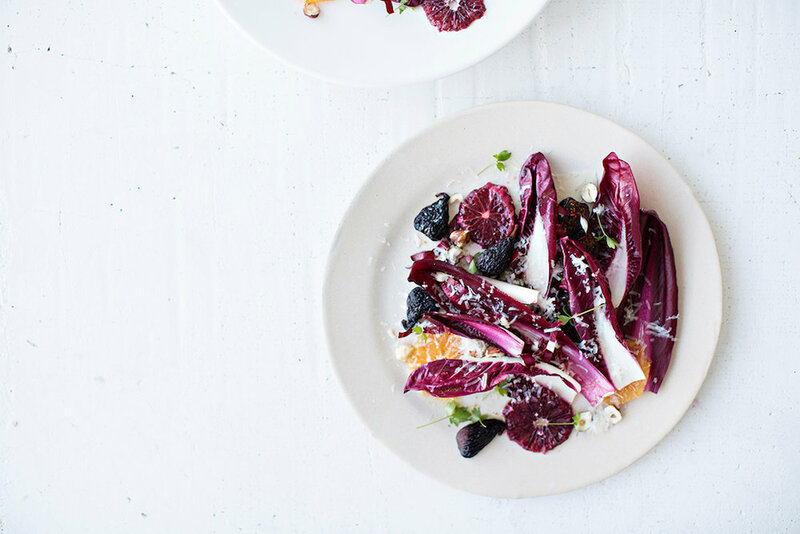 We love to balance our winter dishes with a little brightness and the wonderful taste of Simply Orange does just that in our salad of bitter greens and radicchio. Toast the coriander seeds in a skillet set over medium heat until light golden and fragrant, about 2 minutes. Finely grind the toasted seeds in a mortar and pestle. Combine the ground coriander, orange juice, lemon juice, sugar, salt, and pepper in a bowl and whisk to dissolve the sugar. Slowly whisk in the olive oil. Cut off the top and bottom of each orange, creating a flat surface on which to balance it. Place the edge of a sharp knife just inside the border of the peel, where the pith meets the pulp, and slice down with a firm, clean stroke, following the curve of the fruit. Repeat until the entire fruit has been peeled. Slice the oranges into 3/4” rounds. Add the radicchio leaves to a large bowl, tearing any larger leaves into smaller pieces. Add the treviso and dried figs and toss with just enough dressing to lightly coat. To serve, arrange the lettuces on plates and add a few slices of orange to each salad. Top with shaved manchego and serve extra dressing on the side. To serve, arrange dressed leaves and figs on a platter and distribute blood orange rounds between them. Drizzle with additional dressing and top with shavings of manchego. Sprinkle with flaky white salt to taste. The mix of bitter, tart and sweet come together so nicely in this salad. Never frozen, sweetened or concentrated, Simply Orange juice is the perfect inclusion in our vinaigrette. Inspired by the vibrant colors of the blood orange and treviso, this salad is the perfect way to celebrate the arrival of Spring.